Most of the city council challengers argue that Spokane needs to do much better at preventing and fixing potholes, but incumbents Breean Beggs and Candace Mumm argue that the city is already largely on the right track. On Aug. 1, a total of 10 city council candidates — two incumbents and eight challengers — will face off across three districts. Only six will advance to November's general election. The Inlander spoke to all 10 of the candidates about the issues they cared about. Nobody mentioned last year's mayoral scandal. Nobody mentioned President Trump. Instead, nearly every challenger argued that it was time for the city to get back to basics. Each candidate spoke about the issues they were most passionate about, including lane reductions, cops, jobs, marijuana advertising and — especially — potholes. The incumbent: None. Councilwoman Amber Waldref is term-limited, leaving an open seat. The challengers: Daycare operator TIM BENN was trounced in both of his attempts, in 2012 and 2014, to run as a Republican state representative. Now he's running to be the seatmate of radio talk-show host Mike Fagan, currently the sole conservative on the council. "I think the city councilmembers' job is to focus on the things that citizens are the most concerned about," Benn says. "Currently that is our roads and infrastructure." He says Spokane needs to prepare for the upcoming North Spokane Corridor by spending money to bulk up Hillyard's lagging infrastructure. Benn argues that the city wastes too much money on things like roundabouts, and too much time on international issues. He also floats some unique ideas, like helping cops address out-of-control property crime by sending college students who are studying criminal justice or social services to investigate some property crimes. Benn faces two contenders to his left. Democratic Washington state Sen. Andy Billig's legislative aide KATE BURKE seeks to turn her youth — mocked by Benn earlier this year at a Trump rally — into an asset. "Forty percent of Spokane is under 30 years old," says Burke, 28. "No one is really representing that group." Burke voted for the statewide minimum-wage initiative and supports the city's mandatory sick-leave policy. But when discussing the need for better roads and more cops, she strikes a more moderate tone on taxes. "Eventually, we might need to raise revenue. Right now, my constituents cannot stomach that," Burke says. "We're working families." Instead, she argues that she can use her connections in the legislature to increase state funding for important services like mental health. She sees Hillyard as being shortchanged by city investments. And she echoes the concern that the city is spending too much time focusing on passing toothless resolutions, even though she says often agrees with the resolutions' sentiments. Burke's liberal rival KATHRYN ALEXANDER, a longtime Bemiss neighborhood activist, contrasts herself with Burke by arguing that she's focused on local issues instead of statewide ambitions. "I do not have a grander vision," Alexander says about her ambitions. "I like Spokane. It's grand enough for me." She says the city is seriously underfunded, and doesn't reject taxes as a way to address the gap. "I'm going to look at the budget first to see where we are spending the money," Alexander says. She's allied with Councilman Breean Beggs in considering a levy to fix Spokane's miles of crumbling sidewalks. Alexander was also the only challenger to bring up affordable housing as a priority. She calls housing a "human right." "District 1, in particular, has a huge number of empty houses," she says. "Many are not livable." The incumbent: Attorney and former "chief catalyst" at the Center for Justice, BREEAN BEGGS was appointed to his seat by the council in February 2016. Since then, he's proposed complicated compromises — like seeking a change to the role of the police ombudsman that would satisfy both the police union and police critics. He's authored the legal initiative that would seek to fine certain oil and coal train cars that pass through Spokane, disagreeing with the city hearing examiner's conclusion that the initiative would be struck down in court. And he's floated several tax-increase proposals, arguing that citizens should have a chance to vote on what they've sought to fund. While he supports the hiring of some police officers, Beggs says the city also needs to consider a full-scale overhaul of its public safety strategy. "I'm in favor of really a top-to-bottom, comprehensive look into how we continue to reduce crime and [improve] policing," Beggs says. The challengers: By contrast, Fagan ally TONY KIEPE, a health care consultant for AristaPoint, says the city is wasting too much money on "wants" instead of "needs." He doesn't think that the city should have spent money to build a fancy pedestrian bridge or expand the number of 311 operators. He doesn't think the city should have loaned $1.75 million to developer Ron Wells to put micro-apartments in the Ridpath Hotel. And he's skeptical regarding the city's homelessness strategy. "We don't want to just keep throwing money into it," Kiepe says. "If that's not working, we've got to change it." Kiepe also talks about the need for more police and better roads — but he's not willing to raise taxes to get them. Former Park Board member ANDY DUNAU stakes out the middle ground, describing himself as either a "business-friendly" Democrat or a centrist, touting endorsements from both Republicans like Spokane County Sheriff Ozzie Knezovich and Democrats like former City Councilman Steve Corker. His positions reflect that. On the one hand, he calls Beggs' oil train initiative "unconstitutional" and criticizes the council for trying to mandate sick leave on the local level. On the other, he says he's "totally opposed" to the attempts to undo the city's immigration-status inquiry prohibition. He says he'll focus on roads, potholes, snow removal and infrastructure. "We need to get back to the middle and get business done," Dunau says. He also says that as the city addresses homelessness, it should build case files on homeless individuals to help agencies address the totality of their needs. "If you can't treat the person as a whole, you're playing whack-a-mole," he says. BRUCE VONADA, meanwhile, says he's "better educated, I have more experience, and I'm more qualified than all the [other] candidates." He can tout experience as a pilot, college professor, human resources director and former Alaska city manager. What Vonada can't tout, so far, is any donations or endorsements. Nor has he sought them. "It's like selling your soul in my world," he says. Instead, Vonada has focused on decrying the sheer scale of the city's homelessness problem, and marveling at what he sees as the absurdity of local politics. "$451 to file for office!" Vonada wrote in his candidate filing statement. "What? You think I am made of money?" 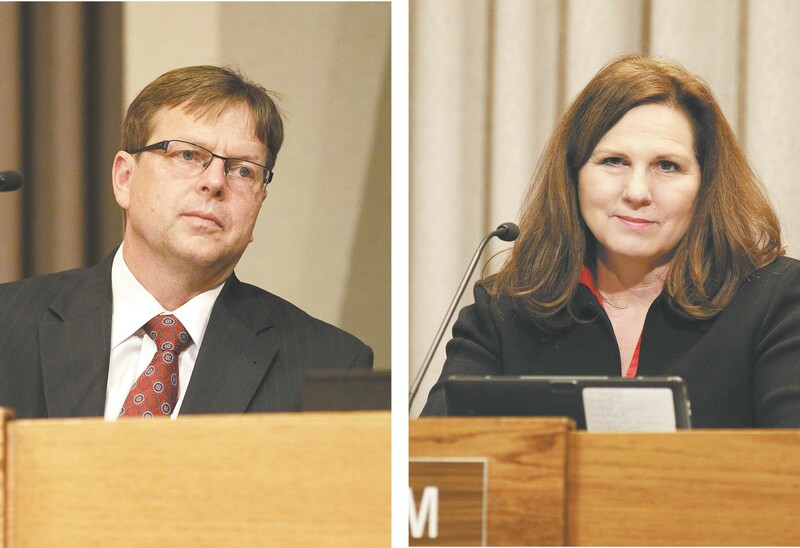 The incumbent: CANDACE MUMM won four years ago on a campaign platform of business-friendly moderation — shifting the council's balance of power toward City Council President Ben Stuckart. Her critics argue that she's largely voted with the liberal bloc, on issues like mandatory safe-and-sick leave. She counters that she helped add provisions to that ordinance to ease concerns for small businesses and startups. Yet she also personally voted in favor of the initiative that hiked the minimum wage and will wipe out the nuances of the city's sick-leave policy. She says it's better for the state to be under one sick-leave policy, instead of a patchwork of different regulations. "The city of Spokane having a separate ordinance than the other cities around us is very difficult to implement," Mumm says. She says she's proud of her work to bring a transit center to West Spokane and improve pedestrian safety through a crosswalk ordinance. In her next term, Mumm says she'd like to concentrate on revitalizing neighborhood centers and fighting property crime. "Just hiring more police won't necessarily solve the property crime problem," Mumm says, noting the city's bipartisan efforts to give car thieves community supervision. The challengers: To Mumm's right comes MATTHEW HOWES, whose life story is the quintessential realization of the American Dream: When he was 6, Howes was one of the Vietnamese children who escaped to America during the fall of Saigon. Today, he's built his own business — Adelo's Pizza. Howes argues that he can bring a restaurant owner's perspective to issues, noting he had to let go two employees because of the minimum-wage hike. He's also particularly focused on opposing marijuana advertising, recently delivering an impassioned speech before the city council about ripping the marijuana-ad stickers off of the Spokesman-Review before his daughter can see them. Howes also jumps on the opportunity to lambaste Mumm for not opposing the lane reduction on a stretch of Monroe Street, an administrator-led project that has infuriated local business owners. Even after construction, Howes says, the city will regret it. "As Spokane continues to grow, they're going to realize in five, six, seven years they're going to need those five lanes," he says. Slightly more moderate than Howes, at least rhetorically, is BRIAN BURROW, a consultant who has contracted with Avista. "I have more suitable experience, with years of economic analysis and working with policy makers and decision makers," Burrow says, contrasting himself with Howes. "I bring diplomacy and an understanding of the process." Burrow says that as a business consultant, he's met with more than 100 aerospace companies, and can use that experience to help attract more manufacturers to the region. He says he isn't opposed to the concept of a lane reduction, but suggests that Monroe was the wrong street to try it on. And while he says he supports environmental efforts, he warns that the city council's vote Monday night to emphasize carbon-reduction benchmarks could hurt Spokane in the long run.